Bravely opening with an instrumental medley, dubbed 'R30 Overture'- comprising bits from six tracks: Finding My Way, Anthem, Bastille Day, Passage To Bangkok, Prologue from Cygnus X-1, and Prelude from Hemispheres - the band are introduced (informally, on-screen) by veteran actor Jerry Stiller. Unusually, they chose not to play Closer To The Heart - one of the band's signature tunes, on this tour but the Canadian progressive rock trio start off with a rousing performance of classic The Spirit Of Radio, still probably their best-known 45rpm 'single' release. This is briskly followed by the powerhouse Force Ten, the soaring Animate, social commentary of Subdivisions, and Earthshine (the first of three tracks from the band's recent studio album, Vapour Trails, that are on tonight's set-list), which I think is hardly their best work of late, but it evidently gains much vigour when played live. Happily, for me at least, the band steers directly into the exhilarating Red Barchetta, next. It's one of my all-time favourites (arguably, rock music's ultimate 'driving song') and is notably inspired by Richard S. Foster's short story A Nice Morning Drive. With its rather disconcerting rap verses, I've never fully enjoyed Roll The Bones, but at least here the song is accompanied by fascinating video and cartoon images to illustrate its theme of taking chances in life. Bravado, obviously concerning the necessities of human courage, features one of bassist and singer Geddy Lee's finest vocals, and he does not disappoint here, recapturing the original recording's soulful emotion: "If the dream is won/ Though everything is lost/ ... / If we keep our pride/ Though paradise is lost/ We will pay the price/ But we will not count the cost" (these last lines may apply to collectors of tour merchandise). YYZ is one of Rush's sharpest instrumentals. It precedes the barbed political analogy of The Trees, which amusingly ends with lead guitarist Alex Lifeson's riffs from The Beatles' I Feel Fine and Day Tripper. These borrowings are merely a prelude to the first of the band's cover versions, The Who's The Seeker. This offers something new from Rush, of course. They've never recorded other bands' material before, yet Spring 2004 found Rush channelling back to their 1960s' roots, to record eight golden oldies for nostalgia CD, Feedback, a fitting tribute to some of their musical influences and a most enjoyable celebration of Rush's three decades together. The band's recent triple-album, Rush In Rio, boasts a superb live recording (also available as an incredible 170-minute concert on DVD). 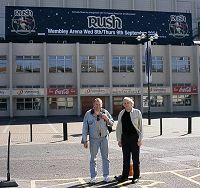 One Little Victory, with its animated dragon, proved to be one of the Brazilian show's most memorable sequences, and that stadium gig's impressively synchronised pyrotechnics are reproduced here in the Wembley Arena, as a dramatic intro to the last song before a 20-minute intermission (Geddy Lee apologising that the band are getting a bit old!). The beast is back on-screen for 'That Darn Dragon', a new cartoon starring Rush as 'cute' rock 'n' roll dinosaurs hatching from eggs to see off a fire-breathing menace. When the band return, they launch into a magnificent rendition of Tom Sawyer ("No, his mind is not for rent/ To any god or government/ Always hopeful, yet discontent/ He knows changes aren't permanent -/ But change is"), before the main lights dim and smoke machines go into overdrive for the green laser show of Dreamline. The next song, Secret Touch, is the hardest rocking track from Vapour Trails, with multi-layered dynamic riffs and the significant chorus ("There is never love without pain/ A gentle hand/ A secret touch on the heart"), borrowing a line from Joseph Conrad's romantic tragedy, Victory. The rarely played Between The Wheels, takes us to the spiritual heights of Mystic Rhythms, and the dark prison camp drama of Red Sector A. Poetic-lyricist Neil Peart's drum solo is a long way from being a self-indulgent exercise, and has steadily been refined over years of touring and live albums to emerge as perhaps the centrepiece, and main talking point, of this remarkable trio's world class musicianship. From the quirky subtleties of wood, metal and electronic percussion to thunderous, pulse-attuned big beats and snare drum rolls, the Professor's awesome virtuosity sweeps us along throughout a succinct, demo 'history' of drumming, and only rigor mortis could keep any listeners' feet still. There's a welcome change of pace as Lee and Lifeson have a well-earned sit down for a highly polished acoustic version of Resist - which Lee admits is "a folk song" anyway (but it adds something fresh to their repertoire, as Rush have ignored rock's past fads for 'unplugged' versions of familiar songs), followed by the second of this show's cover versions, Heart Full Of Soul (by The Yardbirds). Now is the time for a shorter version of Rush's dystopian-future epic 2112, derived from eccentric Ayn Rand's pre-war book, Anthem. This begins with the usual Overture and Temples Of Syrinx, then closes with the seldom performed Grand Finale - with it's booming announcement: "Attention, all members of the Solar Federation/ We have assumed control.../ We have assumed control." If Rush didn't already hold the audience in thrall to their 'show of hands', the band's total command of this appreciative crowd is unquestionable now. Probably the band's supreme instrumental work, La Villa Strangiato includes Lifeson's routinely manic, entirely improvised 'Lerxst' rantings ("The rosy red cheeks of the little children" - indeed! ), and newcomers must surely wonder if the man's absurdly comic outburst results from drug abuse. Please be assured, it isn't. There's another new cartoon playing as backdrop to the fantasy genre duel of By-Tor And The Snow Dog (here performed in an abridged version), and the synthesiser intro to Xanadu (inspired, of course, by Samuel Coleridge's unfinished poem Kulba Khan) triggers yet more psychedelic fractals on the screen. Rush close the main show with Working Man, one of the band's earliest songs, adding a delightful reggae ending to the familiar heavyweight rock guitars. The encore kicks off with Rush's energetic take on Eddie Cochran's Summertime Blues, they bring new resonance to Crossroads (originally by Cream), and this outstanding two-and-a-half-hour show ends with Limelight. 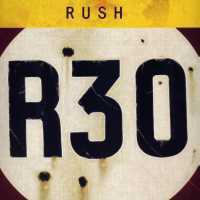 It's a shame Rush neglected to select anything from their 1989 album, Presto(especially as they had performed The Pass during the Rio set) but, including the opening medley, they do 30 songs here, and there's something from every other studio album. I would have liked to hear a few more of my favourites, such as (in no particular order): Free Will, Ghost Rider, Territories, Circumstances, Digital Man, Enemy Within, Red Tide, Something For Nothing, In The End, Turn The Page, Cut To The Chase ("I'm young enough to remember the future"), Face Up, Kid Gloves, Time Stand Still, Dog Years, Cold Fire, Analog Kid, Heresy and, well (You Bet Your Life), the list goes on... but what's offered instead is definitely worthwhile and spectacularly presented.